Cogswell, Kelly J. 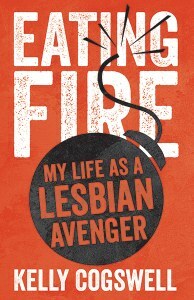 “Eating Fire: My Life as a Lesbian Avenger”, University of Minnesota Press, 2014. “Eating Fire” is a look at radical lesbian life and a coming-of-age story. We see, from the inside, the process and the problems of being a street activist. Cogswell’s book mixes adventure, inquiry and a how to manual on questions of identity, resistance, and citizenship. It focuses on the most effective, most publicized and controversial group, the Lesbian Avengers and, in effect, it is a handbook on intimate activism. Kelly Cogswell became involved in 1992 right after coming out. She was a southern girl, raised in Kentucky but came to New York where she camped in a loft as she wrote poetry. She was a member of an underground band and tried to figure out what her next move in life would be. It did not take long before she discovered the Lesbian Avengers and began “instigating direct action campaigns, battling cops on Fifth Avenue, mobilizing 20,000 dykes for a march on Washington, D.C., and eating fire—literally—in front of the White House”. This is a compelling read that is personal as well as political. When the Avengers fell apart, Cogswell became a journalist and was a co-founder of the Gully online magazine, which had the goal of giving “queer views on everything.” Even while traveling, she stepped outside her role as tourist and immigrant, joining Parisians to protest racism and discrimination and provoking LGBT activism in Cuba. Something new that we see here is the relationship of the Lesbian Avengers to the queer art and activist scene in New York during the early 90s. The Avengers were forerunners of groups like Occupy Wall Street and La Barbe, in France. The book is a rare insider’s look at the process and perils of street activism, Kelly Cogswell’s memoir is “an uncompromising and ultimately empowering story of creative resistance against hatred and injustice”. The book begins in 1992 and the Irish Lesbian and Gay Organization is fighting for the right to march in New York’s annual St. Patrick’s and woe Day Parade; anti-gay violence is prevalent; AIDS has gripped the LGBT community and the nation and mainstream gay and lesbian groups are moving to the center away from the edges of society. They are trying to form their campaign as more of a question of “abstract equality and civil rights”. Cogswell writes with a sure voice full of intelligence and lots of passion. Visibility isn’t change; it is a beginning and she reminds us of that. Even though the Avengers are defunct, the fight for civil rights is more than relevant. This entry was posted in GLBT non-fiction on March 15, 2014 by Amos.